Present a professional image with the new Ultimate Look Book™ Saver. 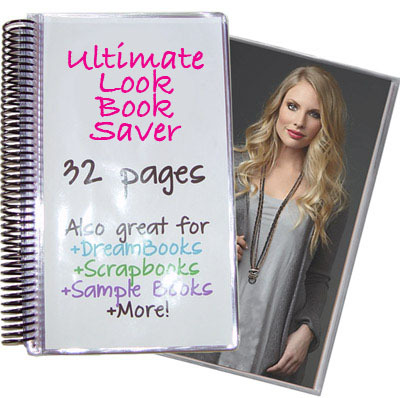 The Ultimate Look Book ™Saver is a re-usable water-proof, tear proof vinyl page protector book. The 32 spiral bound page protectors will keep your Catalog in perfect shape for the entire season. This saver is nearly big enough to hold 2 catalog books. Sell your OVERSTOCK, or sale items, gifts you offer, info on career opportunities, or as a recruiting tool. The possibilities are endless. Use a dry erase marker on the pages to circle sale items or to remember products for certain customers, or just to make notes. It just wipes clean when ready to change things. Will hold pages measuring 6 inches wide x 11 inches high. Of course you can always flip the book around and use them as 11 inch wide pages x 6 inches high. Buy 2 for $50.00. You save $26.00!